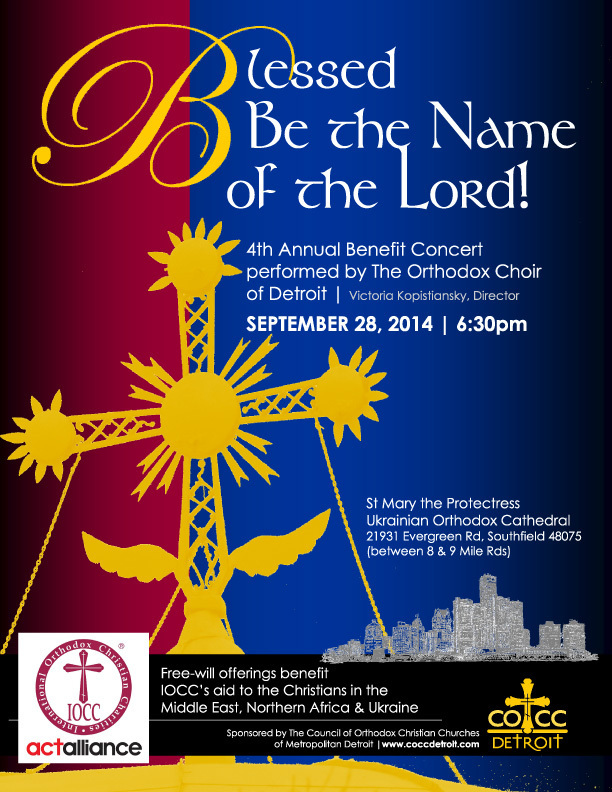 On Sunday, September 28 at 6:30pm, the Orthodox Choir of Detroit, directed by Matushka Victoria Kopistiansky, will sing a concert of Orthodox sacred music, entitled "Blessed Be the Name of the Lord!" at its 4th Annual Benefit Concert, sponsored by the COCC. The concert will be performed at St. Mary the Protectress Ukrainian Orthodox Church, at 21931 Evergreen Rd. (between 8 & 9 Mile Roads) in Southfield. There is no cost to attend the concert, but a free-will offering will be taken to benefit IOCC (International Orthodox Christian Charities) and its aid to those sufferering in the Middle East, Northern Africa and Ukraine. The Orthodox Choir of Detroit is really supperb! It is one of the best Orthodox choirs in the United States. Do come, and bring family, friends, co-workers, neighbors. It is an excellent way to introduce non-Orthodox to the Orthodox Faith, and to revitalize and "rekindle the spark" for those who are Orthodox.